As the old saying goes, a picture is worth a thousand words. 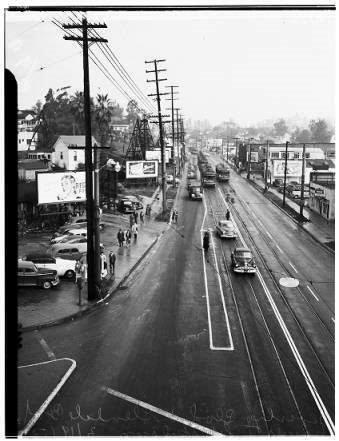 While the exact details of these photos are lost to history, just looking at these photos taken on a damp March 3,1952, taken from the Beverly Boulevard bridge tells an interesting story. It seems that the Toluca substation was experiencing some sort of power problems. The Toluca substation supplied power to the Subway Terminal, Toluca Yard, and up Glendale Boulevard to Temple Street where a insulated breaker separated this area from the Olive Substation some four miles away near Sanbourne Junction. 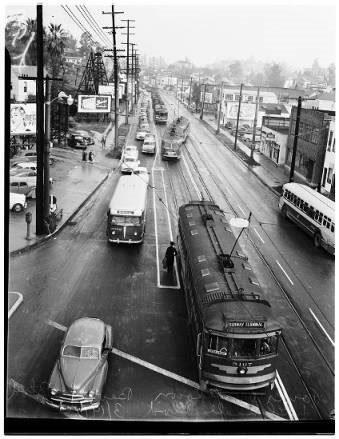 As inbound cars crossed Temple Street, they entered “dark territory” caused by the problem at Toluca Substation. From the looks of things, there was still some power, though very low. Several Hollywood cars were at a stand still just south of Temple Street. One outbound car is seen at Temple Street. Things would only get worse as the minutes passed. 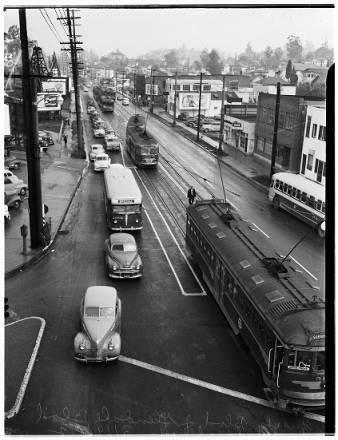 In this photo, the outbound Hollywood car has made across Temple Street and is out of the picture. Two PE buses have arrived to help out with the problem. Passengers from the stranded cars at Temple Street can be seen walking along the damp sidewalk. At the bottom of this photo, ever-trusty no. 5167 (todays OERM no. 717) has just arrived on the inbound track, while a 2-car train of PCCs appears to be stranded on the crossover just up the street. In this last photo, the 5167 is still in the process of changing ends as the PE White struggles to make its way out of the traffic mess. Two interesting vehicles are seen here. The car on the left of 5167 is a very low production 1942 “B-44” Oldsmobile, while the GM 2900 is virtually new, having been purchased for the forthcoming abandonment of the San Fernando Valley line at the end of 1952. 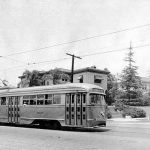 This was just another day in history of the once great Pacific Electric. A little more than a year after these photos were taken, Metropolitan Coach Lines would purchase all of PE’s passenger operations. Had this incident happened under Metro Coach ownership, I am sure Metro Coach management would have immediately applied with the PUC for total abandonment of the entire Western District. It was not to be, at least not on this day. 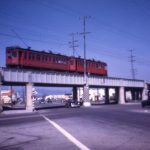 And so, the Western District rail operations would die a slow, but inevitable death under Metro Coach Lines ownership.. That final dirty deed took place on June 19, 1955 with the abandonment of the BEST OF THE BEST, the Glendale-Burbank line. The Toluca Sub rotary converter had a catastrophic failure in 1948, and another unit was installed. Note that 1948 was during the Southern California Edison Co. changeover from 50 to 60 Hz line frequency. Haven’t found any information as to whether the 1952 failure was related to this or not.